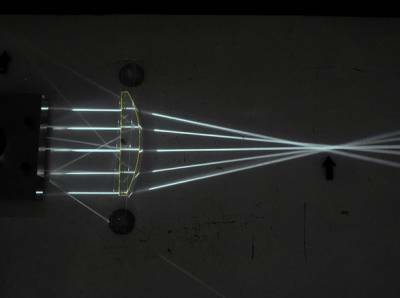 Many of the focus lenses used with CO2 and other lasers are of the single element Plano-convex type. There have been some discussions recently, in various forums, regarding the orientation of these lenses and I would like to clarify the situation. 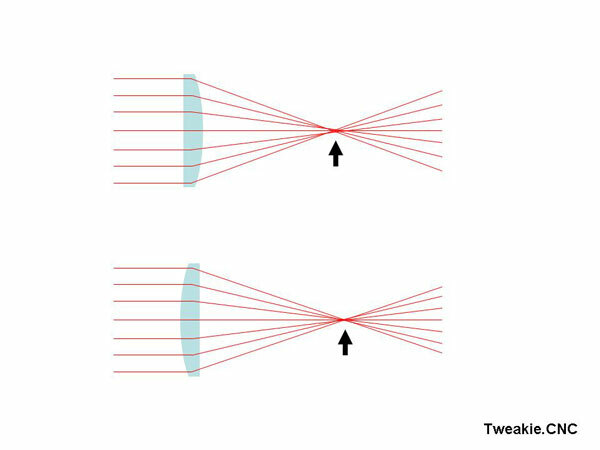 Whilst this type of lens will operate in either direction the focal point will not be as sharply defined unless the convex surface is placed towards the photon source and I have tried to illustrate this point in the following diagram. A simple bench experiment (which I am sure many have already completed in their school days science class) will demonstrate refraction and I trust, the following photo’s may serve to illustrate the difference. Basically, the tighter the focal point the greater the concentration of photons the greater the power and thus the greater the efficiency. 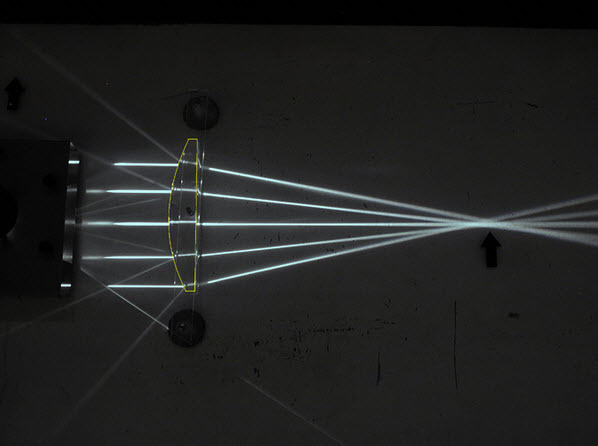 Different types of laser operate at different wavelengths and materials that will appear transparent (to the photon emission) will differ from one type of laser to another. 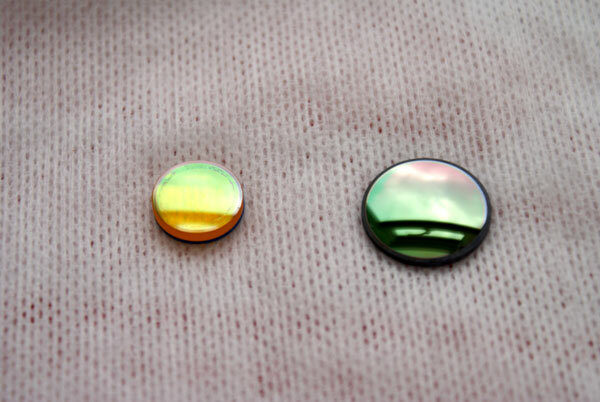 With CO2 lasers the two most common materials used for the lenses are Zinc Selenide [ZnSe] (left) and Gallium Arsenide [GaAs] (right). They each have a number of differing properties but in general the GaAs are considered to be harder wearing and are also more costly so tend to be used more with the professional range of machines. 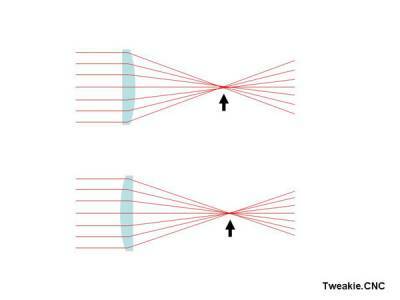 regarding the orientation of these lenses and I would like to clarify the situation. I trust you and I will use this orientation when will nesesary. I see result in pictures, but I do not understand why this difference between two situation? It relates to the function ‘depth of field’. 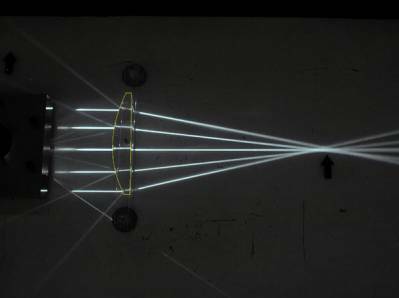 As far as lasers are concerned, the density of photons has been termed ‘power density’ and if we could concentrate all of the available photons into one small spot a 1 Watt laser could have a power density of many Kilowatts. 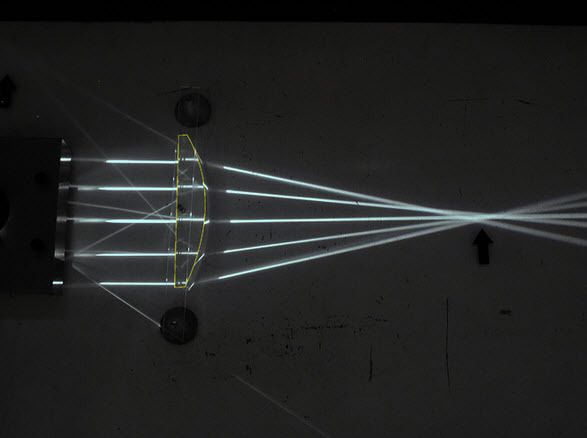 In practice this is not possible with a lens system (because of the inherent aberrations caused) but by placing a plano-convex lens with the convex side towards the photon source it produces a smaller depth of field and when correctly focussed, it will produce a higher power density at the work surface. When it is placed the other way round it produces a greater depth of field, the photons are less concentrated and the power density at the work surface is therefore reduced. (In my earlier example photo’s I should point out that the lens used does not have any anti-reflection (AR) coatings so the backscatter should be ignored).